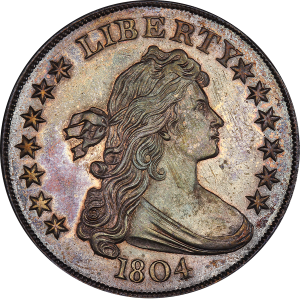 (Lincroft, N.J.)—The Class I Dexter/Pogue specimen 1804 Draped Bust U.S. silver dollar purchased at auction on Friday night, March 31, 2017, for $3,290,000 jointly by Kevin Lipton (Beverly Hills, Calif.) and John Albanese (Bedminster, N.J.) was sold by them less than 48 hours later. 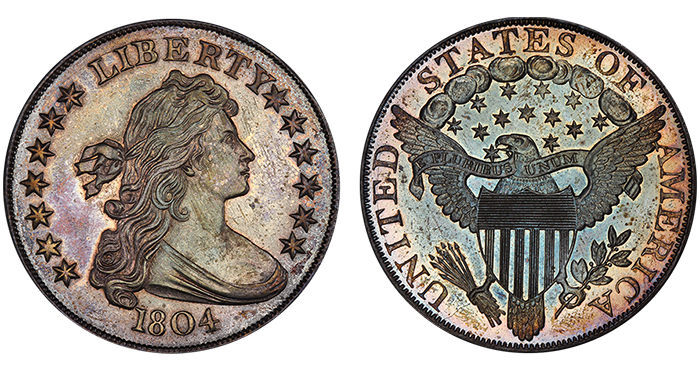 Graded PCGS PF-65, it was bought on Sunday afternoon, April 2, 2017, by Laura Sperber of Legend Numismatics in Lincroft, New Jersey, on behalf of well-known collector Bruce Morelan, owner of the all-time finest set of early American dollars listed in the PCGS Set Registry. “John and I bought the coin [at the Stack’s Bowers auction at the Whitman Baltimore Expo] in a moment of opportunity. We didn’t have any customers for it Friday night; we just thought at $3.3 million that it was the best buy of a high-value rare coin in the last 20-plus years,” Lipton explained. Then the offers started coming in. “We purchased this coin on spec and were really quite shocked that our book bid of $2.8 million (plus buyer’s fee) was successful. We both thought it would sell for $4 million or more Friday night. By Sunday, we had six interested parties who were calling, sending emails and texts wanting to buy the coin from us. Kevin and I are pleased it’s going to a good home,” said Albanese. Learn more about the “King of American Coins” in The Fantastic 1804 Dollar: Tribute Edition. Sperber negotiated the sale on Sunday morning on behalf of Morelan. The purchase price was not disclosed. Morelan also was surprised at the winning bid price for the coin at the auction. “I was shocked when the coin sold so low. I’m happy to pick it up for a few incremental bids over that level. 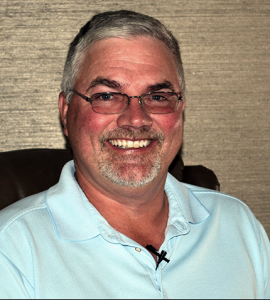 While the coin is not necessary for the circulation-strike early dollars set, it certainly is complementary to my set and collection as a whole,” Morelan said. 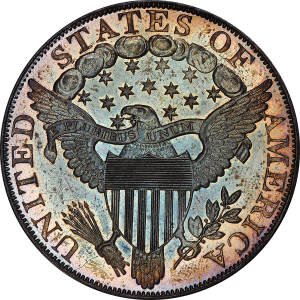 Among the world’s most famous rare coins, only fifteen 1804-dated silver dollars are known today, and eight of them are categorized as Class I, including the Dexter/Pogue specimen. Press release courtesy of Donn Pearlman & Associates.